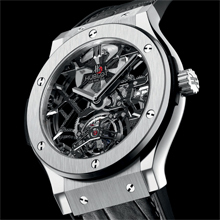 With a chic sporty look which is more classical than the Big Bang, a slimmer profile and a timeless elegance which draws on traditional watchmaking values (while remaining faithful to Hublot's refined and dynamic codes), for the first time, the Classic Fusion is fitted with a tourbillon movement. This was a logical and necessary step to meet demand. In fact, the Classic Fusion line was created in 2008, firstly as a model with 3 hands, then fitted with a date window. 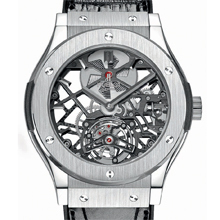 Last year, in 2011, Hublot met with huge success when it unveiled a chronograph model. A refined, graphic and ultramodern design for the queen of traditional Haute Horlogerie complications: this skeleton movement is entirely designed, developed and produced in the workshops of the Hublot Manufacture. On the dial, it is worth noting that the hands are similar in design to those on the very first Hublot watches: a clever reference to the history of the brand. With an impressive 120-hour power reserve and watertight to 5 ATM i.e. approx. 50 metres, this piece is available in two versions, titanium and 18K King Gold, a particularly intense colour of gold, the fruit of a precious alloy developed by Hublot. This colour is obtained by adding 5% platinum to the mass of melting gold, giving it a visual impact which is reinforced by the contrast with the black coating of the other components. Each version is limited to 50 editions.